Jesus in Trinitarian Perspective: An Introductory Christology. Fred Sanders and Klaus Issler, eds. Nashville: B&H Academic, 2007. 244 pages. $24.99. Some doctrines require the full breadth of the theological disciplines for adequate treatment. Fred Sanders and Klaus Issler, as editors of Jesus in Trinitarian Perspective, deem Christology a prime example of such a doctrine. Sanders begins with a substantial introductory essay that delineates the basic elements of Christology and the design of the rest of the book. 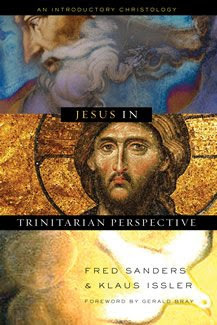 Convinced that “to say the truth about Jesus, we must keep him in Trinitarian perspective,” Sanders explains how this volume explores “the implications of Jesus’ identity as one of the Trinity” (3). He also demonstrates how the logical progression among the six chapters attempts to trace “the long arc” of the biblical metanarrative “from God’s eternal being to humanity’s redemption” (3). After Sanders’ introduction, five scholars from various disciplines contribute an essay investigating a topic along this Christological storyline. J. Scott Horrell defends a social model of the Trinity. Donald Fairbairn analyzes the Christological reflection of the early church. Garret DeWeese investigates the philosophic precision of the “one person, two natures” language. Bruce Ware exposits the atonement in light of the Trinity, and Klaus Issler highlights the example that Jesus’ life provides for believers. A clear strength of this volume is the depth and detail of its introductory elements. Sanders and Issler intentionally shape the book in “a method-transparent way” in order to “model the work of theology” for their readers (40). To this end, each contributor begins with a succinct chapter summary, followed by three “Axioms for Christological study,” which are concise propositions related to relevant concepts. The next section contains a systematized list of key terms developed in the chapter. Each essay also ends with a brief annotated bibliography of works recommended for further reading, which is particularly helpful as the contributors indicate both strengths and weaknesses of these volumes. A set of study questions designed for further reflection ends each chapter. Another fundamental strength is the dual achievement of introducing and contributing to the study of Christ. Seeking to avoid a “purely descriptive work” (40), the editors strive to craft a text that is “safe and trustworthy” but also “filled with a sense of project” (40). This interdisciplinary project is one that views the Council of Chalcedon as a proper guide to the confessional parameters of Christological reflection and champions Cyril as the most important figure in patristic developments. For the contributors of this volume, the language of Chalcedon should be interpreted in light of Cyril’s insight that “the one person of Christ is in fact God the Logos, the second person of the Trinity” (80). Convinced that Trinitarian and Christological speculation should remain tethered to Scriptural language, their proposal also argues for a nuanced view of the social Trinity and the legitimacy of holding that the one person of the incarnate Christ had two natures but only one will (a contemporary monothelite model). They also understand the atonement as a Trinitarian work and Christ’s human life as a genuine model for Christian living. Despite the clarity of the essays, a reader unfamiliar with the terminology of Christological discussion will perhaps be intimidated. For example, the reader encounters the terms “anhypostatic” and “enhypostatic” on the first page, and later “dyophysites” and “kenosis” without immediate clear definitions (28, 74). Also, a few of DeWeese’s specific logical syllogisms may remain oblique to one unfamiliar with this type of argumentation (e.g., 134-35, 140). However, these instances are exceptions, as the contributors are careful to define and explain difficult terminology as it is introduced. Further, these minor concerns do not detract from the fact that, both in substance and in methodology, Jesus in Trinitarian Perspective provides a robust introduction to Christology that will not disappoint the disciplined reader. In Trinity Journal 29.2 (Fall 2008), 341-42.